If you know anything about up and coming tropical destinations, you’ve probably heard of the bohemian paradise that is Tulum. Located only a 2-hour drive south from the more popular Cancun, Tulum shares the same gorgeous Caribbean coast and the same attractions with half the tourists and twice the authenticity. Tulum will always be special to me because it’s the first town I ever visited in Mexico and one of the foundational reasons I’m a Tulum wedding photographer today. With any popular wedding destination there are bound to be pros and cons but with Tulum, I couldn’t bring myself to write anything negative! I decided to opt out of cons entirely and instead gush about the reasons I think Tulum is the perfect place for a local or destination wedding in Mexico. For those considering this beautiful location as the place for you and your soon-to-be spouse to tie the knot, I will not be shy in my attempts to get you to decide on this particular Mexican gem. Here are the 5 reasons you should choose a Tulum wedding package! Nobody likes to overspend on weddings and most are always on the lookout during the planning phase for ways to save money on a wedding – I know I was making cuts until the last minute for my own wedding. But the best part about destination weddings is they are smaller in nature, so only those most important to you are there, which saves a lot on costs you’d spend having a local wedding. I would’ve never guessed before I became a Mexico wedding photographer that a place as glamorous and well put together as Tulum would be so inexpensive if you’re coming from another country. From food to activities to lodging, Tulum continued to impress me by how far my dollar stretched while I was there. Not only is it affordable when you’re there but it’s also affordable to get there, making it an accessible location for a destination wedding, in contrast with a place like Greece. As a Tulum wedding photographer, I’ve stayed in both the more affordable and more expensive options and, to be honest, you’re in good shape either direction you go. Plus, you can binge on the most amazing Mexican food you’ve ever had for half the price you’re used to paying! I’m absolutely an advocate for weddings that look like a winter wonderland, it’s why I jumped at the chance to shoot an Iceland elopement, but generally speaking, having been raised in sunny Florida, I have a preference for a place I can lay on the beach and enjoy the warm water. That preference, which I would assume most share, is another reason why I became a Mexico wedding photographer instead of a Norwegian wedding photographer. When the majority of people envision paradise, they don’t envision thick jackets and boots, they think of palm trees and clear water which are 2 of many factors that make up Tulum’s idyllic atmosphere. You won’t have to worry about finding the right month or season for good weather either like you might have to for other destinations because the weather in this part of Mexico rarely dips below 70 or above 90 which makes it temperate almost every single day of the year. I’m used to having a particular season to work in but as a Tulum wedding photographer, wedding season never really turns off! Whether that’s good or bad for me is another discussion but from the perspective of a bride looking for what dates best fits in her schedule, it’s a huge benefit of going with a Tulum wedding package. One of the many enchanting aspects of Tulum’s great atmosphere are its beaches, an essential environment for a destination wedding in Mexico. I had to separate this from the weather because there are too many things I wanted to mention so knew I wouldn’t do it justice without mentioning Tulum’s beaches on their own. Tulum has the edge when it comes to a few important characteristics of a beach fit for a Mexico wedding photographer. Namely, crystal blue water, and a lush jungle background that make it nearly impossible to take a bad photo. After my first trip out to sea, I came back knowing I was ready to be a Tulum wedding photographer. There tend to be 2 types of people when it comes to beaches: those who want to sit back in a lawn chair and tan with a margarita in hand and those who’d prefer to jump in the water and soak in the surroundings without a server, or anyone else, in sight. Lucky for you, Tulum has both! As an added bonus, for the sunset lovers out there, be prepared for a spectacle nearly as incredible as Tulum’s neighbor on the Pacific side of Mexico. For those who want their wedding to come out looking like a commercial for a tropical beach getaway, you will not be disappointed by a Tulum wedding package. 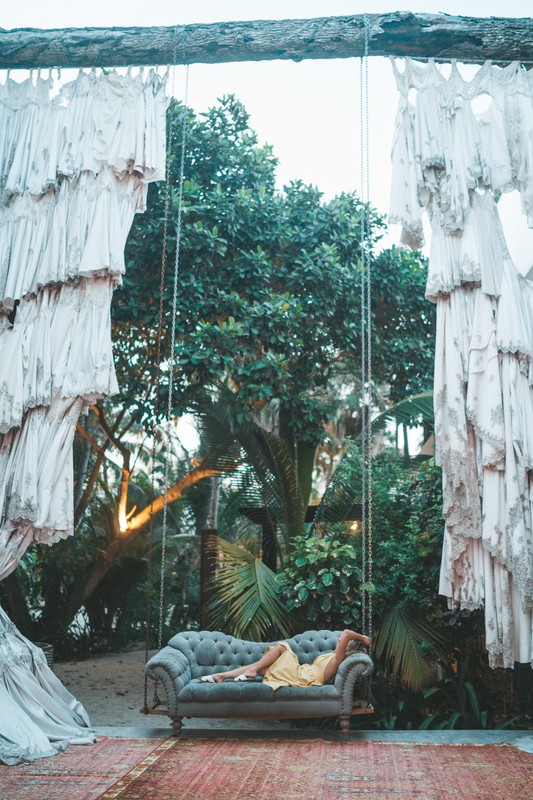 It’s hard to pin down exactly what makes the vibe in Tulum so special but I always look forward to booking a Tulum wedding package because it means getting to experience it, if only for a weekend. Tulum manages to feel both incredibly artistic and chill, providing the perfect escape most people look for in a vacation. A big part of that vibe is cultivated by the boho-chic jungle aesthetic of the resorts, restaurants, and the city itself. That same aesthetic also provides both a unique and stunning backdrop for a Tulum wedding photographer, making every ceremony fit for a wedding magazine. Feeling like you’re living your best life, having gotten away from it all, is a draw most people look for in a wedding destination and if there’s one place in Quintana Roo that has it, it’s definitely Tulum. Everything I’ve mentioned that makes Tulum the perfect place for a Mexico destination wedding also makes it an excellent choice for a honeymoon! As a matter of fact, I’d argue Tulum is just as good as a honeymoon destination, if not better, than as a wedding destination but that’s neither here nor there. Most people leave wherever they have their wedding for the destination they actually want to spend their time but Tulum offers a solution as the place that works wonderfully as both! For those who can’t come to terms with the idea of staying put for a honeymoon, Cancun offers inexpensive domestic flights to just about everywhere in Mexico, making it the ideal port of exit for honeymooners. As a Mexico wedding photographer, of course, I could suggest a dozen romantic and gorgeous options within the country to choose from but for those who envision the south of France or Thailand, Cancun just so happens to offers more international flights than anywhere else in Mexico! Convinced yet? For those who have heard enough and want to hear about the next steps, there’s some helpful advice from a Tulum wedding photographer just for you!